Now that your eye exam is complete, here comes the fun part - buying new glasses. Before you plunge into the hundreds of brands and thousands of frames on FramesDirect.com, ask yourself the following questions to help you make the best choice. 1. What type of lens do I need? If you only need a single vision lens, you can choose from any size frame. If, however, you need bifocals or trifocals, you might want a deeper frame for you a larger viewing area at all distances. Do you like to sport a classic look, or are you into vintage fashion? Using the filters on the site, you can narrow your choices based on personal style and preferred frame shape - think classic, retro, sporty or designer. 3. What will I primarily be doing in these glasses? If you’re going to be active in your glasses, you’ll need durable lenses and frames. Frames with flexible metal are a good idea so that they do not break. You’ll be able to choose the appropriate lenses (like durable polycarbonate lenses) during checkout. 4. Do I have sensitive skin or allergies? If you are sensitive or allergic to certain materials, you may consider choosing a hypoallergenic option like all plastic, nickel-free metal, stainless steel and/or titanium. Simply select the “hypoallergenic” option in the filtering process. 5. 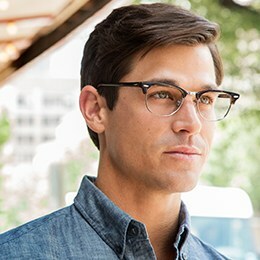 Will I be looking at a computer screen in these glasses? Anti-reflective coating is always a good addition to your lenses. AR coating helps reduce glare from the back of the lenses, which also prevents squinting and eye strain. 6. What color do I want? If you’re retiring your old frames or buying your first pair, you might consider choosing a tone that will match everything in your wardrobe, like black, brown or crystal. If you already own a pair of glasses and want to venture out, take a look at your clothing and accessories and choose a color you wear frequently. Or just pick your favorite color! 7. What are my brand preferences? If you have favorite brands, you can filter your frame choices based on them. FramesDirect.com carries more than 250 high-end and designer brands, so we are sure to carry one you love. 8. What size frame do I need? Look at an existing pair of frames you own to see the size. You’ll see numbers that closely correspond to those on each product page on FramesDirect.com. Choose the size close to yours. If you need help, refer to this handy guide on finding your frame size. 9. How many hours will I be wearing these each day? Many people who need glasses all day every day choose ultra lightweight rimless or semi-rimless frames. Flexibility and spring hinges are also sought out among those who keep their glasses on all day, as these features preserve the integrity of the frames. 10. Do I want one or two pairs of glasses? There are a couple of reasons people need two pairs of prescription glasses: when they want both prescription glasses and sunglasses, and when they want separate pairs for distance and near vision. Some people prefer to switch between glasses. People who only want one pair of glasses often choose transitional lenses that darken in the sun or progressive lenses that include readers near the bottom of the lens.